Rahul Dev Burman, mid 70s, great looking luridly coloured cover art; you know that can't be bad. And yet, 'Zehreela Insaan' is a soundtrack I'm finding harder than usual to get excited over. Something about the songs; they're nice and all, but none of them reach out and grab me with the kind of immediacy I've come to expect from a Burman soundtrack, mid 70s. Oh, there are nice instrumental touches scattered around, there's always that, but I've played this album a dozen times lately and none of the melodies really stick. No hooks. 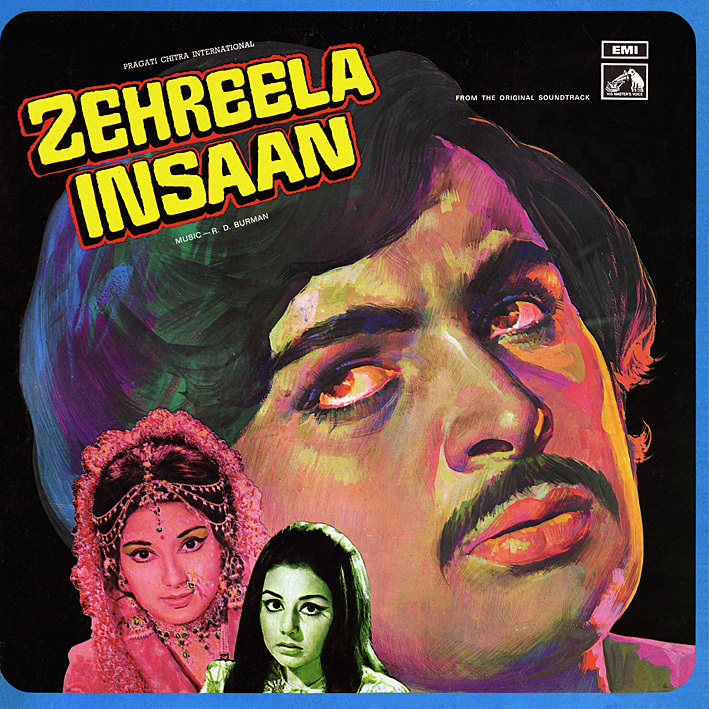 I keep thinking 'Ye Silsila', 'Suno Kahani' and 'O Hansni' will grow on me – the latter in particular has an excellent intro – but annoyingly my interest seems to wane before they end. That shouldn't happen. Maybe I'm spoiled. Luckily the album has a great 'Title Music', action packed and dramatic, and also featured on the mixtape I made earlier this year. Weirdly, the actual title music as heard in the film is completely different. What is that all about? They can't all be classics, pc, but thanks much all the same! In fact this soundtrack is an all time classic by RDBurman.. On hansini in fact has a cult following with all Burman fans.. the intricacies of the guitar melodies are timeless pieces.An amazing romantic song. Ye silsila and mere dil se ye nain too are beautiful in which the latter has some peculiar rhythm patterns.. Thank you PC for sharing. O hansini is a cult amongst Pancham fans. Suno Kahaani says a story. This LP became rare now in India. Many many thanks for this rare & fabulous RD album. Excellent rips. The song "O Hansini" is the best soundtrack of this album. Rest are also very good. Expecting some more rare RD numbers like Bulandi(1980),Maati Mangey Khoon(1984),Jal Mahal(1980), Rahi Badal Gaye(1984) in the coming days. You'll be expecting in vain I'm afraid; I don't have (or plan to obtain) any of the titles you mention. Thanks a lot PC!! Mere Dil se ye nain is my all time favorite. Thanks for sharing! !